Snell started out primarily as a blocking back in his sophomore year at Ohio State, with All-American FB Bob Ferguson and HB Paul Warfield getting most of the carries. He moved to defensive end as a junior, where he was effective, before starting at fullback in his senior season. 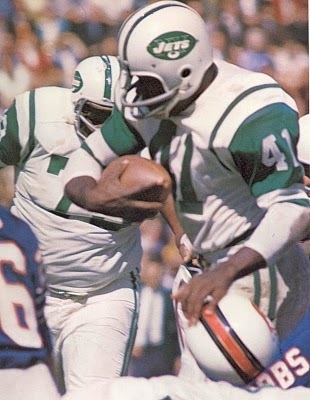 Both New York teams drafted him for 1964 – the Jets of the AFL in the first round (third overall) and the NFL Giants in the fourth round. In a major coup for the new ownership group led by Sonny Werblin, the Jets won the bidding war for Snell’s services. There was speculation as to whether he would play on offense or defense as a pro, but he moved directly into the lineup at fullback. Jets went 5-8-1 to finish third in the AFL Eastern Division. Although bothered by a leg injury, Snell rushed for 763 yards and caught 38 passes in 1965. He was a second-team All-AFL selection of the AP and New York Daily News. A fine blocker as well as ball carrier, Snell was an AFL All-Star in ’66, rushing for 644 yards and catching 48 passes for another 346 yards. A knee injury suffered in the opening game limited him to seven games and 207 yards in 1967, but he bounced back in ’68 to rush for 747 yards as the Jets won the AFL Championship, and he had a 121-yard rushing performance in the Super Bowl upset of the Colts. Snell ran for 695 yards in 1969 and was a consensus first-team All-AFL selection, but a torn Achilles tendon suffered in the third game of the ’70 season effectively marked the end of his career. While he held on for another two seasons, through 1972, further injuries kept him off the field. Overall, Snell rushed for 4285 yards on 1057 carries (4.1 avg.) and caught 193 passes for 1375 yards, scoring a total of 31 touchdowns. He was a first-team All-AFL selection once, received at least some second-team honors after three other seasons, and was named to three AFL All-Star Games.